Times Square, New Years Day, New York City by Hall Groat Sr.
Times Square, New Years Day, New York City 30×40 in. Oil on stretched canvas by Hall Groat Sr. 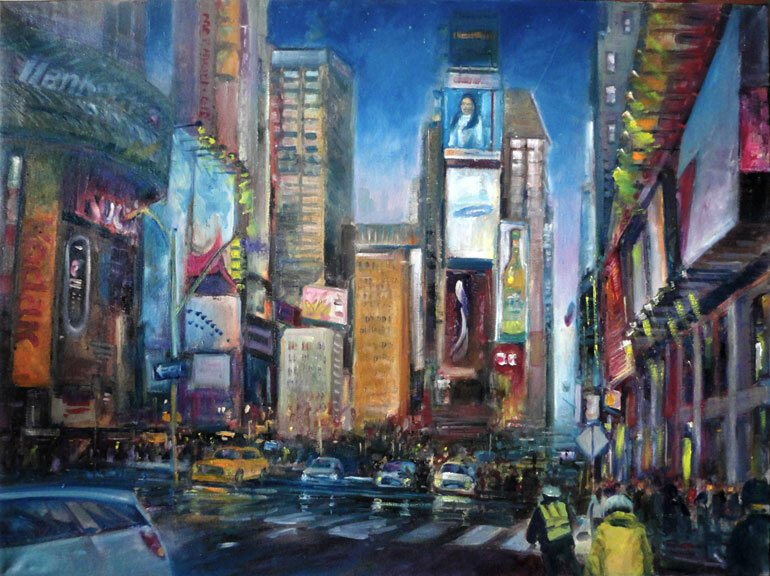 This original oil on gallery wrapped museum canvas is of Times Square in New York during New Years Day in 2014. This masterful piece captures the energy and movement of the figures and automobiles. It’s painted in rich red, blue, yellow, violet, gray and green tones. Amazing how quickly New York City is returned to its fabulous self after a zillion people from every corner of the globe celebrate Dec. 31st. ( which is coincidentally, this artists birthday.) If you think you can identify everything in my painting, it may take several years because there are impressions of signs , iconic landmarks, figures , cabs ,cops — on and on. My impressions of this megalopolis are based on a lifetime of observation. Many collectors inform me of their discoveries years after purchasing my work. Subplots often appearing in this tapestry of mankind are found in the shadows and atmosphere. I find Impressionism the best way to capture the true essence of the worlds favorite place to ring in the new year.